China's Ranik Ultimate Fighting Federation presented their debut event, RUFF 1 - Genesis before a crowd of 3,000 yesterday in Shanghai. "The fights were really great, and any questions about whether or not these guys can fight were definitely cleared up." SHANGHAI – The Ranik Ultimate Fighting Federation (RUFF) finally unveiled their debut event RUFF: Genesis to an eager crowd of 3,000 at the Shanghai Qizhong Tennis Center on August 27th, and any lingering questions about the future of Chinese MMA were quickly answered as 18 of China’s top mixed martial artists squared off in the country’s most spectacular MMA show to date. Genesis kicked off with Xi’An Sports University Bantamweight (61kg) Ayideng Jumayi defeating China Top Team’s Cui LiuCai via unanimous decision - 30-26, 30-26,-30-26. Cui was deducted a point in the second round for repeatedly refusing to stand up, and Ayideng methodically used his Sanda background to strike his way to victory. After Club Hero Featherweight (66kg) Dong YanJun defeated UMAC’s Li LinLin in another unanimous decision, Xi’An Sports University Featherweight Xue GuoBin squared off against China Top Team’s Zhao WuHeng in a highly-touted fight. 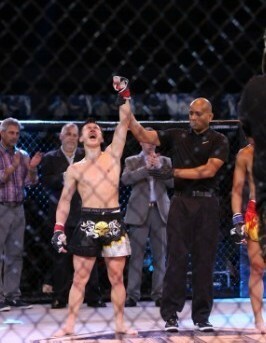 Unfortunately, Xue was disqualified in the first round after landing what appeared to be a number of low blows. With three fights in the bag, RUFF: Genesis heated up as China Top Team Bantamweight grappler A-Mu RiJiRiGaLa looked to revenge his teammate’s injury against Xi’An Sports University striker Zheng Peng. 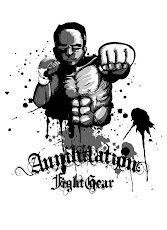 What initially looked to be a predominately stand-up fight quickly went to the ground, as A-Mu won by first round submission with a nasty arm bar. Next up, Xi’An Featherweight Jumabieke Tuerxun made quick disposal of Club Hero’s Li BoLin via first round KO. Awarded the “Ducati Motorcycle’s Knockout of the Night,” the 172cm Jumabieke landed a devastating blow against his much taller opponent (Li standing 185cm), briefly knocking Li unconscious. Zilong Zhao and Robert Sothmann stand toe-to-toe. Midway through Genesis, the Shanghai audience, which included Government officials and executives from Nike and Ducati, all of whom were impressed with China’s first MMA event to feature unified rules, warmed up to their first dose of MMA, the crowd noticeably excited by Jumabieke’s KO, which served as great segue into the first Lightweight (70kg) match of the evening which featured lauded Xi’An Sports University striker Wang Guan doing battle with American Ramsey Dewey. While matchmakers initially saw this as an even pairing of two quality stand-up fighters, Wang finished Dewey in 45 seconds via TKO, landing a quick combination of punches that left Dewey bloodied, dazed and unable to continue. After a brief intermission, it was time for the evening’s top Bantamweight matchup, as Xi’An’s Zhang MeiXuan faced off against UMAC’s Liu PingYuan. In what was later named the “Nike Pro Fight of the Night,” Zhang and Liu exchanged blows over two rounds, landing strikes before hitting the mat. Unable to continue mid-way through the second round, Liu had veteran MMA referee Jerin Valel call the fight, awarding the victory to Zhang. Seven fights down and two to go, Xi’An Sports University Light Heavyweight (93kg) Zhao ZiLong entered the RUFF cage to do battle with Canadian Robert Sothmann. 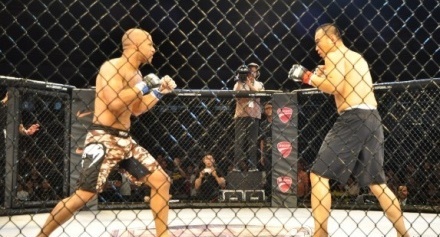 In what would be the evening’s only Light Heavyweight matchup, Zhao and Sothmann exchanged punches, pinning each other against the sides of the cage. While Sothmann drew first blood, Zhao landed a heavy right hand, sending Sothmann stumbling, and eventually hitting the mat. Zhao quickly pounced on his grounded opponent, delivering a number of blows to Sothmann’s head before Valel ruled the fight a TKO in favor of Zhao, 3:40 into the first round. With their first event a wrap, RUFF now has their sights set on a follow up event this fall, but for now it’s safe to safe that Chinese MMA is alive and well.